Two special purpose logic categories—computer and peripherals, and wireless communications—are forecast to round out the top five largest product categories for 2018. Four of the five largest categories in terms of unit shipments are forecast to be some type of analog device. Total analog units are expected to account for 54% of the total 318.1 billion IC shipments forecast to ship this year. 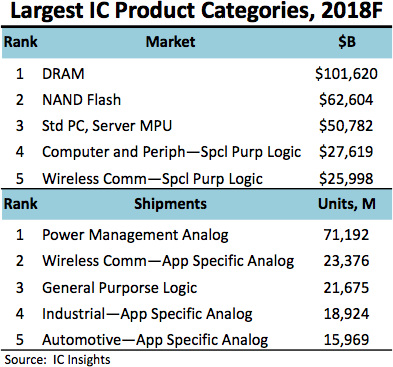 Power management analog devices are projected to account for 22% of total IC units and are forecast to exceed the combined unit shipment total of the next three categories on the list. As the name implies, power management analog ICs help regulate power usage and to keep ICs and systems running cooler, to manage power usage, and ultimately to help extend battery life—essential qualities for an increasingly mobile and battery-powered world of devices.